Are The New Viewers Gone Yet? My website exploded yesterday. I’ve had some big days, thanks to links from PZ, but I actually went viral all on my own yesterday. 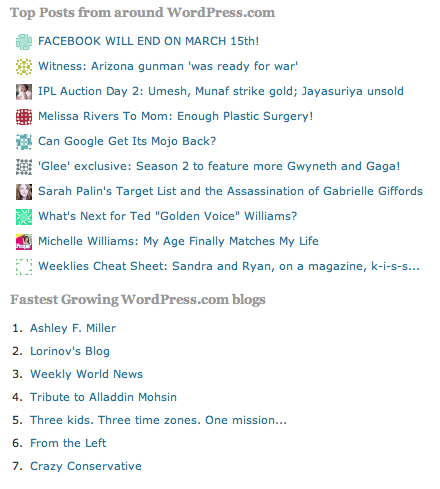 I mean, nothing like Afro Ninja, but I was a top ten post on WordPress with 20k hits in 12 hours. The hits have already become relatively anemic compared to that, but there are still plenty of new eyeballs coming in my direction. My hopes that one of them is a Hollywood Producer who wants to make my scripts haven’t been fulfilled, but the day is young. Also, nominations for the bloggies are still going on, if you kind stoppers by would be willing to put me up for best kept secret or best writing.